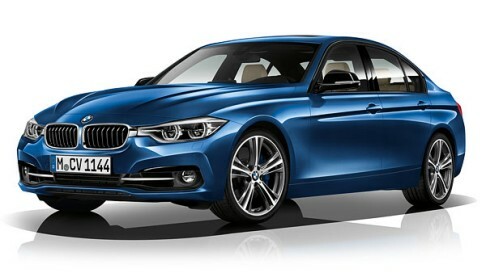 BMW has launched the new 330i petrol edition in India at price of Rs 42.4 lakh (ex showroom, New Delhi) for the base model and Rs 44.9 lakh (ex-showroom, New Delhi) for the M Sport variant. The BMW 3 Series is one of the sporty sedans in its sixth generation. It has irresistible combination of dynamic design, supreme swiftness and brilliant everyday practicality that makes your every drive impressive as ever. The BMW 3 Series Sedan continues to bring you traditional design and features that brings you sportingly elegant exterior. It is designed to create the effect dynamics looks at first sight. This car has come with combined headlights, the outstanding BMW offal grille forms a symphonic unit and follows on from the front design of earlier models, thus highlighting the sporting character of the vehicle. A view from the side highlights the precise curves with extended, ascending giving it enhanced dynamic character. The striving bonnet is one of the striking moves giving this car an iconic compact sports sedan. The interior of the BMW 3 Series Sedan will surly impresses you with its high-quality standards. It encloses the driver with classical driver guidance. The space designed to give prime access to all the control functions on the instrument display. You can get convenient access to the controls through instrument panel that opens up to the driver. The steering wheel is in lined with great features at one point behind thus directing the driver’s view fully onto the road. Diesel Engine– The new diesel engine is constructed with lightweight aluminium. It is packed with one three turbochargers with variable turbine geometry. It also comes with direct injection, which guarantees optimum combustion to further reduce fuel consumption and CO2 emissions. The petrol Engine- The petrol engines are powered with 4-cylinders that boast high dynamics and low fuel consumption with twin power turbo technologies. They are more efficient, with fewer emissions and better performance than their predecessors. The numbers state for themselves as the engine in the BMW 320i delivers excellent performance with its 135 kW (184 hp) powertrain and accelerates with 270 Nm from 0 to 100 km/h from a standing start in just 7.3 seconds. The innovative function with the perfect blend of luxury and power has positioned this car to the sheer driving pleasure. Next articleAll New Maruti Ertiga: Drive Effortlessly!